When I was younger I used to borrow books from the public library. I had no problem with the idea of ​​returning them after reading them, even proud that I was never late with deadlines and I was satisfied with the idea that I could use the book exactly as much as I needed. Now I note with amazement that I do not like the idea. I have not read a book from the library for many years and avoid borrowing books from friends, simply selfish because I do not like the feeling you have when you have to give them up after you finish reading. However, there are rare books for museums or collectors worth tens of millions of dollars or euros for one to have them. The smell of an old book or document, makes us from the first moments to be more careful with what we have nearby or carefully study and to realize the value of these important cultural objects. The fact is that this desire to have books inspired impressive libraries and transformed us all into collectors. But for some, the obsession goes further. The price they are willing to pay for a “piece of history” is amazing, and when I say “piece of history” I mean the book value is initialed by time, which were sold at exorbitant prices. I presents to you a short list of the most expensive books ever sold. The Gospels of Henry the Lion is an illuminated manuscript made for Henry the Lion, duke of Saxony and Bavaria in 1188. It is bought at an auction in 1983 for $ 32 million Deutsche Marks. It is currently kept alternately at the Herzog August Library in Wolfenbüttel and the State Library of Bavaria. The manuscript is dated after 1175. It could have been made to serve the liturgy practiced at the altar dedicated to Our Lady commanded by Henry the Lion and his wife Matilda of England for the St. Blaise Cathedral of Brunswick in 1188, as suggested by the miniature big folio. From the style of illuminations and dedicatory poem manuscript, it could have been done by the scriptorium of the abbey of Helmarshausen. Later, in the fourteenth century, the manuscript might have been in the possession of Charles IV, Holy Roman Emperor who transfers in Prague. It has a new binding in 1594. In 1861, King George V of Hanover acquires Chapter of Prague for the sum of 10,000 thalers. After 1905, the manuscript is kept by his son Ernest Augustus of Hanover, in the castle Cumberland near Gmunden in Austria. After 1945, it is located in England. Several sales attempts fail because of its high price. In 1983, the manuscript is placed at auction at Sotheby’s in London. It is acquired through a fund bringing together the German Federal State, the Foundation of Prussian Cultural Heritage and the federal states of Lower Saxony and Bavaria for the amount of 32.5 million Deutsche Marks, making it to this date the most expensive book in the world. 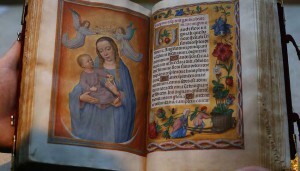 The manuscript is kept alternating between the Bavarian State Library in Munich and the Herzog August Library in Wolfenbüttel as he is visible a few weeks a year. The manuscript contains over 226 folios, two miniature signings (f.19r and 171V), four portraits of evangelists, an image of the creation of the world and 20 other full-page miniatures depicting New Testament scenes, 17 guns concordances, 9 decorative pages at the beginning of the Gospels, 84 large and 1500 small initials. It was probably calligraphed by Herimann scribe whose name appears at f.4v. He wrote the poem dedicatory entirely in gold. The decorations are the result of the work of a complete workshop. The iconographic program may have been inspired by the Anglo-Saxon manuscripts in Saxony would have brought the royal couple after their exile in England between 1182 and 1185. The Book of Rothschild Prayer is a book of hours illuminated manuscript dating from 1510-1520 years now in a private collection. It was executed by the most famous illuminators of the Ghent-Bruges school: Gerard Horenbout, Gerard David, Alexander Bening, Simon Bening. A time preserved in the Rothschild family, he seized the occasion of the Anschluss in Austria and is found preserved in the Austrian National Library. He returned to the family in 1999. There is no evidence to identify the manuscript Sponsor: no picture, no coat of arms. In the sixteenth century, the manuscript belongs to the family of Wittelsbach: the binding features the lion rampant of the Count Palatine and the arms of Bavaria. Ernst Trenkler, the manuscript would have belonged to Ernest of Bavaria (1554-1612) and would have been included in the Palatine Library of Heidelberg, but there is nothing to prove. The manuscript reappeared in the nineteenth century: it is probably acquired in the late 1860s by Anselm von Rothschild of Vienna who became interested in Flemish painting and manuscripts of the same origin. He also acquired the Prayer Book of Albert of Brandenburg or Hours of Joanna I of Castile. The book is inventoried at number 597 of the Collector catalog established in 1871. His son Nathaniel Anselm von Rothschild inherits the manuscript in 1874. It is kept at the Palais Nathaniel Rothschild in Vienna and is estimated at 150,000 in 1906. Her crowns made Alphonse (1878-1942) inherited it in turn with her property. On the occasion of the Anschluss in 1938, the palace was seized by the Nazis with all collections therein. Rothschild collections are sent to swell the personal collections of the Führer. Allied troops found them at the end of the war in the Altaussee salt mines. The family does not manage to recover all of its collection: the Austrian state power to cede one third of its works, the manuscript in exchange for permission to take the rest abroad. The book of hours is then incorporated in the collections of the Austrian National Library (Cod.Vindob. Nova Series 2844). Following international diplomatic pressure, Austria finally passes a law in 1998 on the restitution of art seized by the Nazis. The manuscript was finally returned in 1999 to Bettina Looram, daughter of Alphonse de Rothschild. 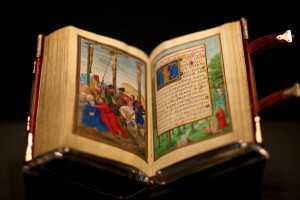 All recovered collections are sold at auction at Christie’s in London in July 1999 and the book of hours sold 8.5 million, record price at the time for an illuminated book. It is acquired by a European collector early 2013 to a record $ 13.3 million US dollars. A new auction is organized for the new owner January 29, 2014 in New York and the work is then evaluated between 12 and 18 million. It is acquired for a private collection for the sum of $ 13.6 million, making it the most expensive illuminated manuscript of the world on that date. The Bay Psalm Book was the first book printed in English now known in North America. The book is a Psalter, and was first published in 1640 in Cambridge, Massachusetts. The Psalms are metrical translations into English. The translation is not very polished or poetic language, and has remained in use, although some of the issues that were sung have survived (for example, Old 100th). However, its production, only 20 years after the landing of the Pilgrims at Plymouth, Massachusetts, is a considerable an achievement. Several editions were made and remained in use for over a century. The first residents of the Colony of Massachusetts Bay brought with them several books of Psalms Ainsworth Psalter (1612), edited by Henry Ainsworth for use by Puritan “separatists” in Holland (1621 Psalter Ravenscroft), and Sternhold and Hopkins Psalter (1562, which had several editions). Obviously, they were not satisfied with the Hebrew translations in these harps, they wished one that was closer to the original. They hired “thirty godly ministers,” as Richard Mather and John Eliot, to undertake a new translation. The first impression was the third product of the press Stephen Daye, and consisted of one hundred forty eight sheets, including a prologue to twelve pages, “A Warning to the reader,” and an extensive list of errata entitled “Mistakes escaped in the impression“. 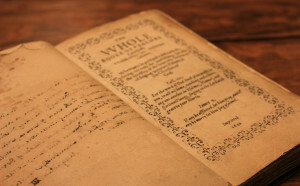 The first edition of the Bay Psalm Book with music was the ninth edition, 1698, which includes issues of John Playford ‘s A Breefe Introduction to the Skill of Musick (London, 1654). The book contains the name of God in his version IEHOVAH and some verses from the Psalms. There are known to be eleven copies of the first edition of the Bay Psalm Book. One of them is in the Library of Congress, one is owned by Yale University, one at the Brown University, one at the American Antiquarian Society, one in the Rosenbach Museum and Library and two, located in the Boston Public Library’s Collection Rare Books and are the property of Old South Church in Boston. The Gospel of St. Cuthbert Gospel is a manuscript dating from the seventh century preserved in the British Library. Its leather binding decorated particularly well preserved, is the oldest known example of binding in Western Europe. With its format of 138 × 92 mm, this is one of the smallest known Anglo-Saxon manuscripts. Its vellum 94 folios have the Latin text of the Gospel of John in clear writing and devoid of illuminations. Placed in the coffin of Cuthbert shortly after his death in 687, the gospel is likely remained in the centuries that followed, despite the tribulations of the coffin due to Viking invasions. The coffin ends up in Durham Cathedral, and the book is removed in 1104, when the translation of the relics of the saints. It is kept in the Cathedral among other relics, and distinguished visitors were allowed to wear it around their neck in a leather bag. After the Dissolution of the Monasteries ordered by Henry VIII in the sixteenth century, the book seems to have passed into the hands of several collectors before being offered to the Jesuits in 1769. It is therefore maintained at the Jesuit school Stonyhurst College, Lancashire, hence its other name “Stonyhurst Gospel.” In 1979, the gospel is on loan to the British Library, which bought it in April 2012 with an appeal for donations. The original binding, in red goatskin, is the oldest known intact western binder, and is one of the few known examples of work still existing island leather. Unique in the bindings of the early Middle Ages, the main motif appears in relief. The panels of geometric patterns with son tracery two are closely related to illuminated manuscripts island, including carpets recall their pages. Some decorative elements also recall the work of the Anglo-Saxon metal, origin of the pattern of interlacing, and Coptic or Near Eastern motifs. The covers have three lines dug filled with pigments: light yellow, pale yellow and a third dark blue-gray, as older blue give descriptions. These three colors appear on the cover, but the back cover does not present a pale yellow. The blue pigment appears to have suffered the most over time, breaking the balance of the drawing blankets. According to the bookbinder Roger Powell, light yellow green was perhaps originally: the coverage would have been at the origin of blue patterns, green and yellow on a red background. Without benchmarks, it is impossible to determine whether the techniques used for the gospel or not were common at the time, but the quality of the work suggests that the bookbinder had a good experience. However, the analysis by the medievalist Robert Stevick suggests that the covers had to follow a sophisticated model constructions with ruler and compass using “both real measures of geometry“: the ratio between constant Pythagoras and 1 d On one hand, the other hand golden section. However, production errors resulted in deviations from the desired proportions. Although the text was probably produced at the Abbey of Wearmouth-Jarrow, it is possible that the binding was added later to Lindisfarne. The scrolls of plants can be compared to those of the portable altar also found in the coffin of Cuthbert, but also to the staff of the Anglo-Saxon cross Penrith or Vespasian Psalter. Small holes in the folds of each signature suggests a temporary binding, can be performed for the transport of Wearmouth-Jarrow pages of manuscript Lindisfarne. 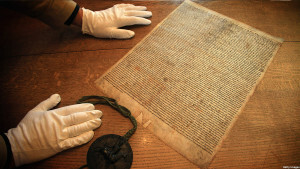 The Magna Carta Libertatum or Great Charter is a charter of sixty-three articles presented by English barons to King John Terrenote 1 June 15, 1215 after a brief civil war marked in particular by taking London, May 17, by rebels . The barons were angered military with financial requirements of the king and mad about his repeated failures in France, especially at Bouvines and La Roche-aux-Moines. The assertion, widespread in France, that the Magna Carta “was written in 1215 on French soil in the Cistercian Abbey of Pontigny by English emigrants, rebelling against their king, John Lackland,” but historians and the most recent studies find no such thing. The only proven link between Magna Carta and Pontigny is the Archbishop of Canterbury, Stephen Langton, who lived in the Abbey between 1207 and July 1213. But if he took part in the drafting of the Magna Carta, no History element proves that he did before the charter of King Henry I, dated 1100 serving as a base, was found in St. Paul’s in London in 1214/1215 as Raoul columnists Coggeshall and Barnwell, or earlier than Aug. 25, 1213, according to Roger Wendover – anyway after the archbishop had returned to England. This “Great Charter of Liberties of England“ guarantees the right to freedom. It limits the royal arbitrariness and establishes the right of habeas corpus prevents, among other things, arbitrary imprisonment. The text guarantees the feudal rights, freedoms against arbitrary royal cities and establishes the monitoring of the tax by the Grand Council of the Kingdom. The Archbishop of Canterbury Stephen Langton ardently defends the barons, his name remaining the first to have been affixed as a witness of the Great Charter. When Pope excommunicated the barons, Langton, who refuses to publish the forbidden, is suspended by the Pope. This charter is the oldest major demonstration of a long historical process that led to the rules of constitutional legality in Anglo-Saxon countries. There are in the public right a number of misconceptions about the Magna Carta, and they say it was the first document to legally limit the power of an English king (it was not the first and it was created based partly on the Charter of Liberties); it would have greatly limited the power of the King (it has not done in the Middle Ages); and it would have been a single document of its kind (such material is designated by a general name). Great Charter was renewed during the Middle Ages, and later at the time of the Tudors and the Stuarts, the seventeenth and eighteenth centuries. In the early nineteenth century most clauses had been repealed in English law. The influence of the Magna Carta outside England can be observed in the United States Constitution and the Universal Declaration of Human Rights. In fact, just about every common law country with a constitution has been influenced by the Great Charter, making it perhaps the most important legal document in the history of modern democracy, but brand especially the passage of a single absolute state, that of a rule of law, due to the limitation of royal power it poses. After the conquest of England by the Normans in 1066 and the territorial acquisitions in the twelfth century, the English king, Richard the Lion Heart appears in 1199, the year of his death, as the most powerful sovereign in Christendom. This was due to a number of factors studied a very centralized government, created under the procedures of the new Norman masters combined with the systems of government of Anglo-Saxon native and extension to England from the Norman feudalism. But after the coronation of King John in the early thirteenth century, a series of spectacular failures he suffers led the English barons to rebel and to be placed under supervision the king’s power. 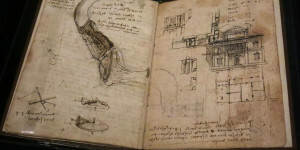 The Codex Leicester is a collection of scientific writings mainly by Leonardo da Vinci. It is named after the first Earl of Leicester, Thomas Coke, which bought it in 1717. It comes in the form of 18 double sheets, 72 pages format 21.8 × 29.5 cm. The codex gives a rare insight into the mind of the thinker, artist and scientist of the Renaissance. It is an outstanding representation of the relationship between art and science and the creativity in the scientific process. Most drawings and manuscripts of Leonardo da Vinci were kept by his pupil Francesco Melzi until his death in 1570. The Leicester Codex is an exception. Guglielmo della Porta, the sculptor was in its possession from 1537. In 1717, the painter Giuseppe Ghezzi (who had found among other documents that belonged to Guglielmo Porta delle) sold it to Thomas Coke, Earl of Leicester. The manuscript remained in the family home of Holkham Hall in Norfolk until 1980. He then went on sale at Christie’s on December 12, 1980. 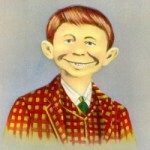 This is the billionaire Armand Hammer, who won the auction. Hammer built the Hammer Museum in Los Angeles, to house his collection of paintings and drawings, as well as the Leicester Codex, which was renamed the Hammer Codex. In 1994, the museum decided to part ways. This time it was Bill Gates who brought in manuscript. 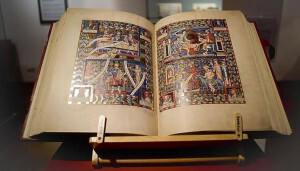 He gave back the manuscript its original name, Codex Leicester. The Codex Leicester is exposed every year in a different place. So it was the case in 1997 at the Senate in Paris in 2004 at the Château de Chambord, in Tokyo in 2005 in Dublin Chester Beatty Library in the 20073 and exposure the Master of Water at Spa in 2009. The first edition of the Codex Leicester was the work of Girolamo Calvi in ​​1909. A first CD was dedicated to Codex Hammer in 1995 by Alessandro Vezzosi, a second was conducted under the direction of Carlo Pedretti in 1996. Dated around 1508-1510, in comparison with other manuscripts of Leonardo, Codex is made out of 18 sheets of paper, each sheet being folded in half and each side of the sheet is written on, the complete document therefore contains 72 pages . Codex sheets were numbered in the sixteenth and seventeenth century related, according to the double-stacking of sheets 18 folded by their environment. This presentation does not allow the reading of Codex. The current presentation restores its original configuration as separate layers such as Leonardo da Vinci had made. Only this presentation could allow its study. It has the distinction of being written in mirror writing (or mirroring), that is to say that the text is upside down and it takes place in front of a mirror to be read. The pages are punctuated with numerous drawings and diagrams. Codex is not shaped in the form of a linear book is a collection of observations in a variety of areas, like the universal genius that was the author: theories on astronomy; the properties of water, rocks and fossils; air; heavenly light. An explanation of the fact that we can find fossils in the mountains. Many years before the tectonics plates were accepted as a scientific theory, Leonardo was convinced that the mountains had formed the bottom of the sea long ago, which was gradually raised to form mountains. The movement of water is the main subject of the book. He also wrote about the flow of water in the rivers, and how different obstacles along its way affects the stream and flow. From his examinations he wrote recommendations for the construction of bridges and erosion. The brightness of the moon. Leonardo imagined that the Moon was covered with water, which reflected sunlight. In this model, the waves on the surface of the moon reflected sunlight in different directions, this explains that the moon is not as luminous as the sun itself. He explained that the Moon’s luminosity is caused by sunlight reflected from our planet.